Ever wondered how you can get permission to play a film at a student orientation event on campus? Or how to share your lecture slides on Canvas when they contain copyrighted images? 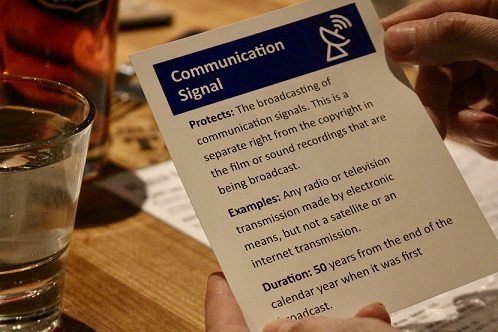 Local Lower Mainland academic librarians gathered at a pub in downtown Vancouver during Fair Dealing Week to explore these questions and more by playing Copyright the Card Game, a free game that can be downloaded from the web and played in teams. 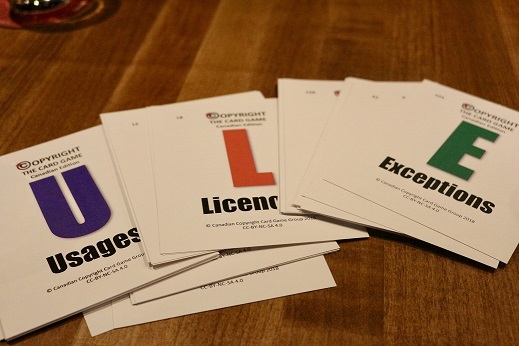 The pub night and game were hosted by the BC Academic Libraries Section (BCALS) of the BC Library Association (BCLA). 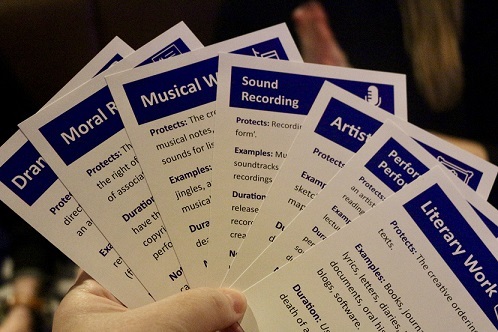 The game is played in 5 rounds, with the first four rounds each using its own "suit" of cards, and the final challenge round using all four suits. In round one we were challenged to decide which copyrighted works categories (literary, artistic, musical, dramatic, etc.) applied to an object that each team was given - a DVD, a book of art, and a comic book. Round two was about copyright usages. What type of usages (such as copying or adaptation) apply when a blogger uploads an image they found on the web? Round three challenged us to think about copyright licenses that would apply for a student to screen Black Panther during orientation week. Round four looked at exceptions to copyright - including Fair Dealing - which apply for an instructor uploading lecture slides to a Learning Management System. In the final round, teams used all four categories from the first rounds (works, usage, licenses and exceptions) to address a scenario involving a Fine Arts professor making a 3D printed version of a sculpture that is on permanent display in a public park. 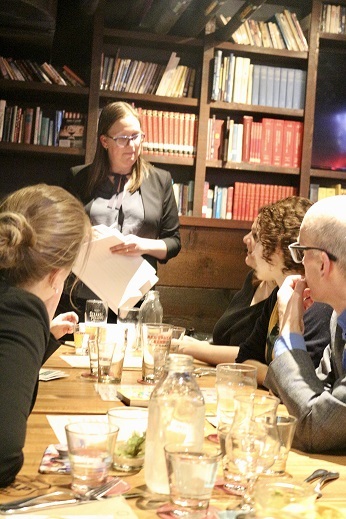 Many thanks to the librarians who participated in the game, as well as to Ioana Liuta from BCALS who helped organize the event, and Jennifer Zerkee, Copyright Specialist at SFU Library, who co-organized the evening, facilitated the game, judged the rounds, and kept score. For help with copyright questions at SFU, visit copyright.sfu.ca or email copy@sfu.ca.